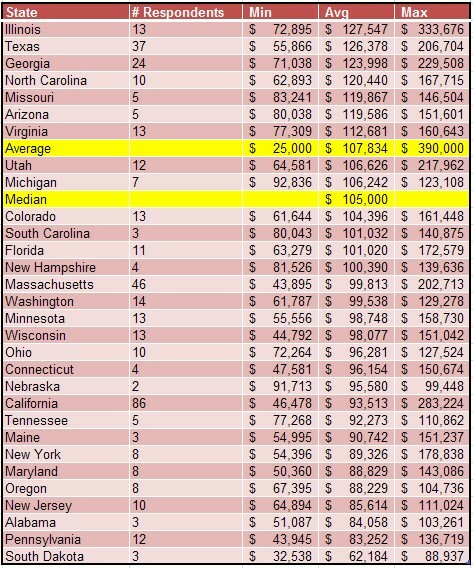 We re-analyzed some of our earlier numbers with the final data, including compensation by region and state. We also looked at some other factors, like who you report to, how large your company is, and if your company is public or private. In our earlier analysis of 2007 product manager salary data, we only had the initial results. The analysis in this article is of the full data set (excluding people who reported non-product manager titles, like executives). In all of the analyses, total compensation is the sum of reported salary and reported bonus. The tables with smaller print can be clicked on to view a larger version. The average and mean salary points are shown in yellow in the following tables to emphasize the regions that have average compensation above and below the average and the mean values for the entire data set. We looked at both global regions, and within the United States, compensation by state (where 3 or more people were in the state). 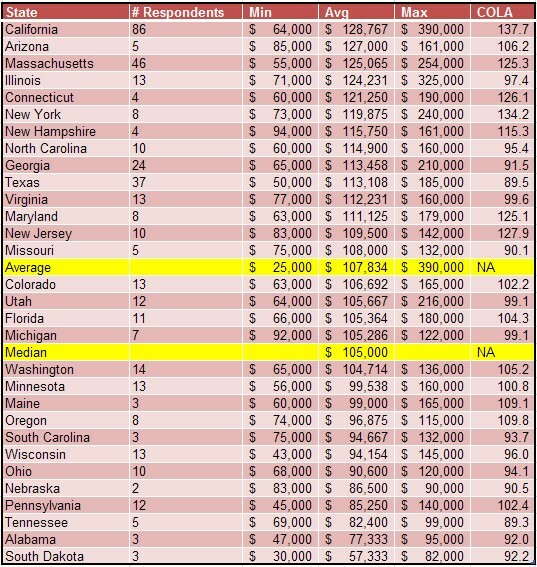 We also look at the cost-of-living adjusted values for individual states. An interesting question that comes up often for product managers is about reporting structure. The organization into which a product manager reports can have a significant influence on what the product manager is asked to prioritize. Product managers often report into marketing or engineering organizations. This reporting can influence how much time the product managers get to spend on “strategic” activities. And now, many companies have dedicated, discrete product management organizations. What was very surprising was to see the high variation in reported compensation, when sorted by the departments into which the product managers report. Another surprisingly correlated factor is the industry in which the product manager operates. Resellers and eCommerce product managers reported significantly lower total compensation than product managers in other high tech industries. We performed this analysis previously, so we’re including it here. There wasn’t much insight to gain from looking at the variation in average compensation as a function of the age of the company. There is an argument that large companies won’t pay high compensation because they manage to the middle, where beaurocratic mass gets in the way of hiring investments. On the other side of that coin, there is an argument that says that small companies can not afford to pay high compensation. Public companies are also often under scrutiny for managing their compensation plans, and private companies often do not share equity as part of compensation packages. With competing forces along both of these axes, how do product manager compensation rates vary? First, we need to look at the number of respondents in each category. With the exception of very large private, and very small public companies, we have a reasonable distribution of responses – surprisingly even, in fact. We’ll look at compensation when sorting by each of the possibilities. Sorting the company size based upon product manager compensation shows the overall trend. The largest companies pay distinctly better, the smallest companies pay distinctly worse, and the companies in the middle pay about the same. When we re-organize the data to focus on how those companies are capitalized, we see some more actionable trending. Sorting based on private company compensation levels shows that private companies over $25 million in annual revenue pay better than average – and smaller private companies pay below average. There is a marked drop in compensation for those smallest private companies. Sorting based on public company compensation levels shows that only the largest – over $500 million in revenue – public companies pay better than average. These largest companies pay distinctly better than the others. Note that for private companies, working for a very large company does not yield such distinct differences. This wraps up our analysis of the 2007 Product Manager compensation data, unless someone writes in to request a particular analysis. Thanks, and hopefully this information is useful to you in your next negotiation! I am in an interesting situation where I left school about a year early to be in the beginning stages of a start up. I have been there two years, we are just over 1 mil per year and really starting to grow to probably 5 mil in 08. Do you have any stats on age of respondents, tenure etc?